No matter if you were born and raised in New York or if you just moved here, you’re sure to have seen countless delis throughout your daily travels. Some of these delis have nothing to set them apart from the others, bearing nothing but neon signs that say “DELI.” So, how do you know which of these thousands of delis are worth grabbing a sandwich from before you head to the beach this summer? Luckily, All Island Transportation has some advice as to which New York delis are the best. Though it may derive much of its fame from a scene in the 1989 movie When Harry Met Sally, Katz’s Delicatessen’s sandwiches are not to be slept on. The self-proclaimed “King of New York” when it comes to pastrami sandwiches, Katz’s offers a “quintessential taste of Jewish New York” and should be on the bucket list of any fan of pastrami or corned beef. 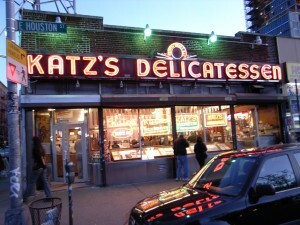 It’s usually packed for a reason, so whether you get hungry while spending a day on the Lower East Side or you’re on a pilgrimage to hit the best New York delis, Katz’s is a great place to check out. Tucked into the picturesque Flatiron District of New York City, Eisenberg’s Sandwich Shop boasts one of the best tuna melts in New York. If you’re not a fan of fish, try one of their burgers, which pair perfectly with their egg creams and milkshakes. Still not convinced? Their slogan is “Raising New York’s Cholesterol Since 1929,” so you know that you’ll be getting something huge and delicious for the price you pay. 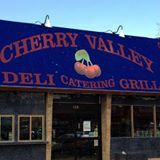 With locations in West Hempstead and Queens, Cherry Valley Deli & Grill offers some incredible food. Though the sandwiches seem to have random names, such as Fiddler’s Green, The Ugly and Bushman, their contents are calculated to perfection. Of course, Cherry Valley’s menu is not limited to sandwiches. Try one of their equally tasty salads, soups or wraps if you’re not in the mood for a sandwich. Open 24 hours a day, Cherry Valley Deli & Grill is a perfect place to fulfill your late night cravings for delicious deli food. Voted best Long Island deli of 2015, the SeaQua Deli is certainly worth checking out. Whether you’re looking for a breakfast sandwich with super fresh ingredients, a healthy yet delicious salad or a steak sandwich with melted cheese dripping from its toasted hero bread, the SeaQua Deli’s exceptional staff will prepare you a meal to your satisfaction. 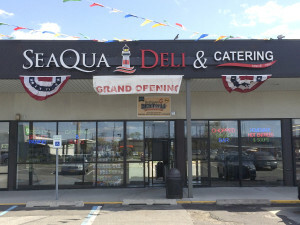 The SeaQua Deli is conveniently located in both Massapequa and St. James. The Adelphi Deli’s menu is chock full of huge sandwiches with bigger flavor. With sandwich combinations you could never have imagined, it may prove difficult for you to pick a menu item. The truth is, no matter which sandwich you choose, its flavor and quality will leave you more than satisfied. If you’re not in the mood for a sandwich, fear not. 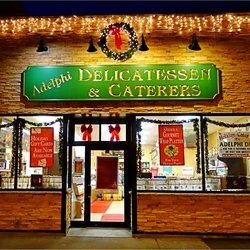 The Adelphi Diner has a long list of salads and dressings, wraps and seasoned grilled chicken breast for you to choose from, so you’re sure to find something to suit your tastes at this great Garden City deli. The next time you have a craving for deli food, be sure to check out one of these excellent New York delis. If you need a ride, please feel free to call us at the location nearest to you or make a reservation online!